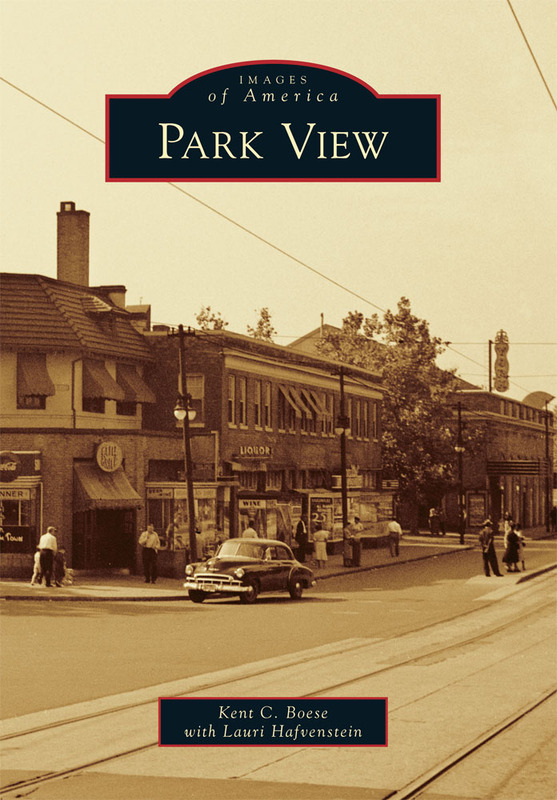 alcohol | Park View, D.C.
As a follow up to the serious & violent incidents on Georgia Avenue, and the two specifically related to La Morenita, MPD has issue a temporary closure of the establishment. I’ve been in communication with both MPD and ABRA and have the following update from ABRA which I am sharing to keep the community informed. The Alcoholic Beverage Regulation Administration is investigating an incident at La Morenita Restaurant at 3539 Georgia Avenue, NW. Additionally, the Metropolitan Police Department issued a 96-hour closure for the establishment effective as of 8 p.m. last night (Nov. 20). The Alcoholic Beverage Control Board will issue a decision prior to the 96-hour closure expiring on Friday regarding what additional enforcement action, if any, is appropriate pursuant to § 25-826 (provided below). 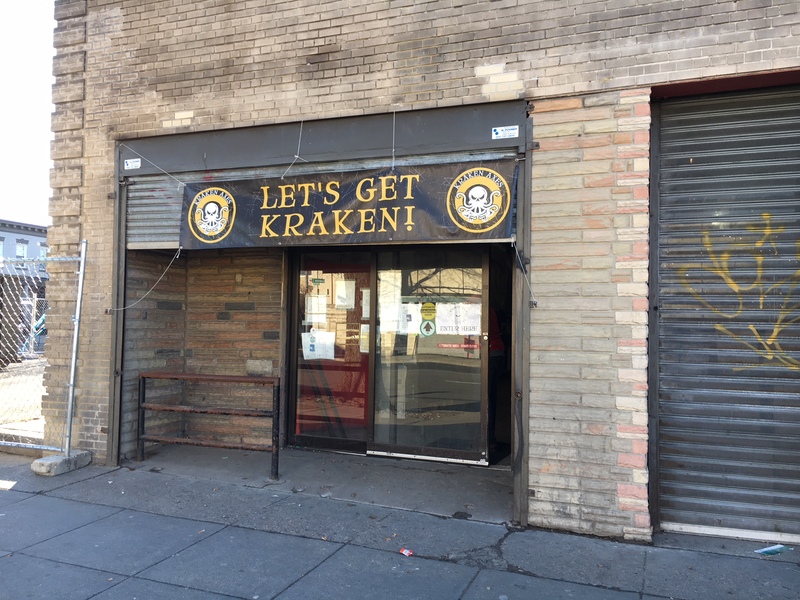 (a) If the Board determines, after investigation, that the operations of a licensee present an imminent danger to the health and safety of the public, the Board may summarily revoke, suspend, fine, or restrict, without a hearing, the license to sell alcoholic beverages in the District. (b) The Board may summarily revoke, suspend, fine, or restrict the license of a licensee whose establishment has been the scene of an assault on a police officer, government inspector or investigator, or other governmental official, who was acting in his or her official capacity, when such assault occurred by patrons who were within 1,000 feet of the establishment. (c) A licensee may request a hearing within 72 hours after service of notice of the summary revocation, suspension, fine, or restriction of a license. The Board shall hold a hearing within 48 hours of receipt of a timely request and shall issue a decision within 72 hours after the hearing. (d) A person aggrieved by a final summary action may file an appeal in accordance with the procedures set forth in subchapter I of Chapter 5 of Title 2. (a) The Chief of Police may request the suspension or revocation of a license if the Chief of Police determines that there is a correlation between increased incidents of crime within 1,000 feet of the establishment and the operation of the establishment. The determination shall be based on objective criteria, including incident reports, arrests, and reported crime, occurring within the preceding 18 months and within 1,000 feet of the establishment. (2) There is no immediately available measure to ameliorate the finding in paragraph (1) of this subsection. (c) The order of the Chief of Police to close an establishment under subsection (b) of this section shall terminate upon the disposition by the Board of the matter under § 25-826. (a) If the Board orders the suspension or revocation of a license, the Board shall post a notice in a conspicuous place at or near the main street entrance of the outside of the establishment. (b) The posted notice shall state that the license has been suspended, the period of the suspension, and that the suspension is ordered because of a violation of this title or of the regulations promulgated under this title. (c) Any person willfully removing, obliterating, or defacing the notice shall be guilty of a violation of this chapter. When the Amendment repealing Prohibition was fully ratified on December 5, 1933, the issue of regulating and taxing sales of alcohol was taken up. Early on, it was decided that the method by which this would be accomplished — both in states and the District of Columbia — was by the use of tax stamps. 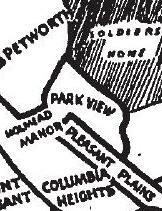 The District Commissioners planned to begin collecting taxes and license fees on beer, wine, and liquor beginning in early 1934. They estimated that Washingtonians would consume enough hard liquor in 1934 to bring the per capita consumption to seven-tenths of a gallon, or 350,000 gallons for the entire city. 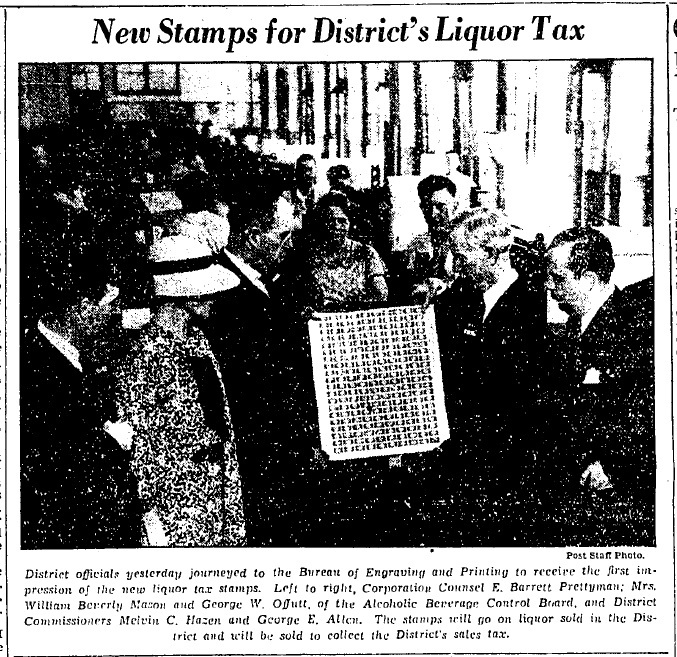 The District Commissioners ordered the preparation of 3,450,000 District liquor revenue stamps from the Bureau of Engraving and Printing on May 10, 1934. Each container of taxable beverages sold after June 1, 1934, would need to have a stamp affixed to it to verify that the tax had been paid, and beverage dealers were required to make a complete inventory of their stocks as of May 31, 1934, in preparation of the stamp tax system. Additionally, each stamp would be canceled by the stamping of the license number of the dealer across the face of the stamp. Interestingly, once the stamps went into use, stamp collectors began attempting to purchase the stamps for their collections, but their requests were turned down. The stamps were for revenue purposes only. 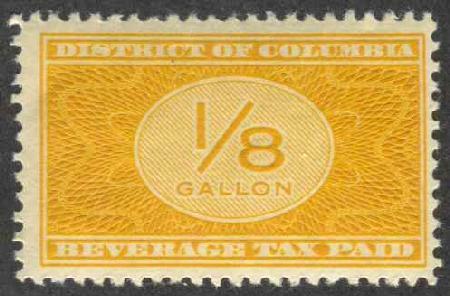 According to an article published on June 3, 1934, the stamps were produced in sheets of 50 with the words “District of Columbia” at the top and ” Beverage Tax Paid” on the bottom. In the middle between the words in large figures the design contained a numeral 1/4, 1/2, 1/8, 1/16, etc. above the word gallon. While the stamps were all the same size, they were printed in different colors for different types of alcohol, which similarly corresponded to the different tax rates for each. The alcohol stamps were printed in yellow and originally priced as following: 1 gallon, $1.10 each, or, $55 for a sheet; 1/4 gallon, 27 1/2 cents per stamp, or, $13,75 per sheet; 1/2 gallon, 13 3/4 cents per sheet, or, $6.88 per sheet; and 1/16 gallon, 6 7/8 cents per stamp, or, $3.44 for a sheet. Wine stamps were green and taxed at the initial rate of 35 cents per single 1 gallon stamps, or $17.50 per sheet of 50., with a similar rate structure for lesser volumes as the other types of beverage tax stamps. The Government collected $184,923,525 in alcoholic beverage taxes in the first seven months of legalized liquor sales. This included $7,554,374 from Maryland (including the District of Columbia) and $49,276 from Virginia. While the system worked reasonably well, it was not without problems. Initially there was confusion between some of the colors and which types of alcohol they should be affixed to leading some purveyors to affix incorrect, and higher rate stamps to the wrong bottles. Changes in the tax rate also resulted in some merchants attempting to stock up on stamps at the lower tax rate to use after the rate change took affect. Liquor dealers began advocating for the end of the stamp tax system at the end of 1956, stating that the system was archaic, expensive, and labor intensive with no benefit to consumers. The stamp system was finally ended in its entirety in 1961 and replaced by a monthly reporting system.